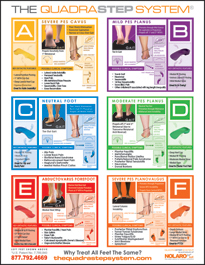 We have everything you need to start dispensing QUADRASTEP® Orthotics to your patients TODAY! FREE Training Webinar - learn the simple 4-step foot-typing process so you can start immediately! Your 38 Pair Starter Kit gives you every Quad and every size so that you have everything you need to fit your patient with the correct QUADRASTEP® orthotic. Be sure to have stock on hand to dispense once you fit your patient, that way you can keep your Kit complete! You can also order pairs on an as-needed basis. You can order either regular or narrow width orthotics, and topcovers are available as an extra option. Want to customize QUADRASTEP® orthotics yourself? Try a Widget Kit! Kit includes a variety of self-stick wedges, heel lifts, and met mounds. Get more information on customizing your orthotics on our Customized Orthotics Page. Read more about our Widget Kit on our Blog, Kylie's Corner. ASK US how you can add littleSTEPS® foot orthotics for kids to your Kit at an amazing price!